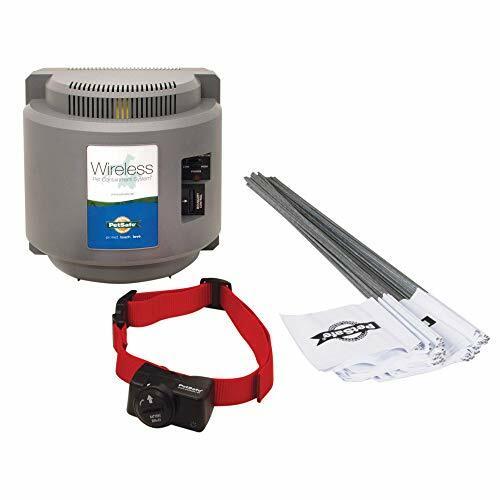 The PetSafe Wireless Fence pet containment system is a revolutionary concept that provides the safest, simplest form of pet containment ever. Plug in the transmitter somewhere inconspicuous in your home. The transmitter emits a 17.5 kHz radio signal around your home. Your pet wears a lightweight receiver collar that “listens” for the signal. While the collar is receiving the signal, your dog is free to run and play in your yard. When he approaches the boundary of the signal area, he receives a warning beep. If your dog does not return, he receives a static correction which is startling but not harmful. With a little simple training, your dog will quickly learn his boundaries. The training of your pet is a key element with the PetSafe Wireless Fence. Follow the easy instruction and training manual that is included. For use in the US only. This unit is compatible with all US 110v outlets and are not to be used with 220v international voltage.